Not since the buffoon and former president of Mexico Vincente Fox has been in office, has a politician south of the border made this kind of news. As a graduate of the Harvard Business School, one wonders if all true leftists gain their socialist glee from our own academia. Enough of Fox, and on to Mexican President Andres Manuel Lopez Obrador. I’m just going to refer to him as ‘Amlo,’ since I’m not sure which of the dozen or so given names his surname is. Amlo has unveiled a new plan to curtail illegal immigration to the United States by focusing on creating economic “free zones” along the U.S.-Mexico border. Let’s look at his past to see where he is going. A politician has not come to power on a protest platform since the Mexican Revolution. Amlo views his election as historic and reminiscent of its independence from Spain in the early twentieth century. Liberal reforms of the time broke the Catholic Church in Mexico, while the Amlo reforms intend to extinguish the blight of the masses. Mexico has many of the ingredients that cause revolt. An anti-big business leader that has the financial markets in angst and its own peso wondering what will happen next. Macroeconomic conditions have improved somewhat, but have an ominous South American ring. Growth is constrained by lower oil production, weak oil prices, low productivity, a still-large informal sector that employs over half of the workforce, weak rule of law, and corruption. Just stir in a little populist uprising, and there you go. 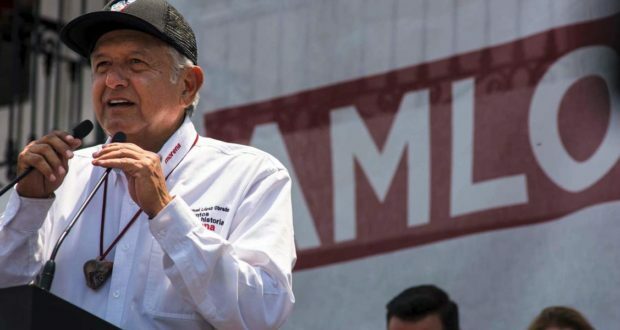 Amlo models his rhetoric after Lazaro Cardenas, the autocratic leader of Mexico in the 1930’s, who immediately began his march to power by nationalizing the oil industry, as any good totalitarian would do. It is yet to be seen if Amlo will respect the legislation put in place to somewhat restrict presidential power. What good revolutionary wouldn’t want to crush capitalism, nationalize oil, and rid themselves of the “fifi,” the Mexican slang for the bourgeoisie? “I think he is resurrecting the imperial presidency of 30 or 40 years ago,” said Jose Antonio Crespo, a political analyst at Mexico’s Center for Economic Research and Training. “But it is also mixed with Lopez Obrador’s personal style, which is disorderly, ambiguous, contradictory and capricious.” The “fourth estate” makes no pretense in offering up Amlo as one of their own from the left. In a short time, he will be held as the hero of socialism ala Chavez and Castro. More beloved than our own leaders on the right. The proposal would reduce the incentive for Mexicans to migrate to the U.S. and increase competition among local businesses, which is positive. However, some fear that Mexican companies, attracted by low taxes, might move to the free zone and create an overall loss of tax revenue for the country as a whole. This would not be good. Perhaps the most interesting prospect lies not to its north, but to Mexico’s southern border. After all, we are told that the majority of the recent caravan hail from Central America. Amlo is reportedly considering creating a border force to stop illegal immigration and stem the tide of drugs and illegal guns entering Mexico. This was reported by Bloomberg in an interview with Alfonzo Durazo, future chief of public security. All seems to lend to making the immigration system more tenable, as Amlo promotes policies that should help America. A wrenching number in a still corrupt country was documented by Etellekt, a risk analysis firm, who reported in July that over 130 politicians were killed in the approximately nine months leading up to Mexico’s presidential election. Amlo says he will travel without armed guards. Peace be with him. You should know that Mexico achieved independence from Spain in 1821. That was the early 19th century and not the early 20th century.